We’re all proud of our kids, at some point or other. It’s not a big deal, really. In fact, it would be really odd if we weren’t ever proud of them. Some achieve great things, some less great but feel equally momentous. Either way, they are our kids and we find ourselves constantly marvelling at the way in which they navigate their way through life. 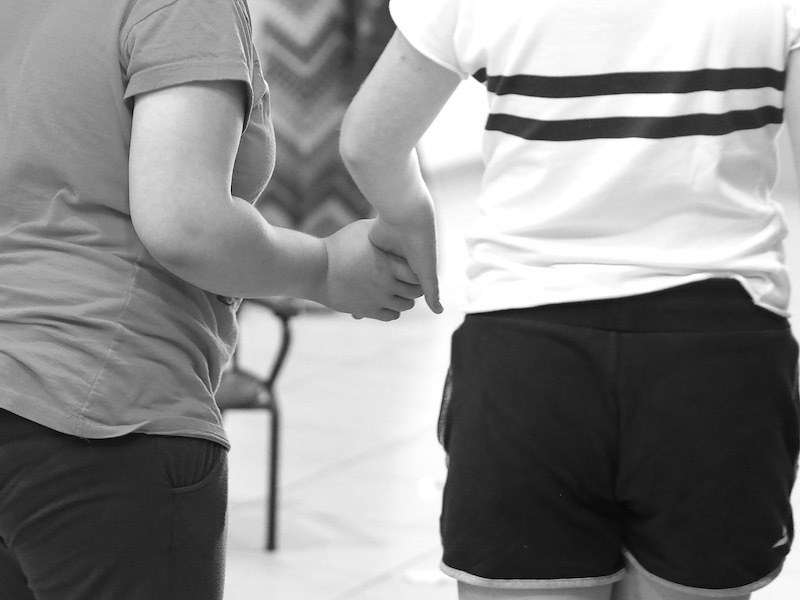 However, this blog post is not one of those: I’m so proud of my daughter and how she decided she wanted to get involved with those less fortunate. Certainly Not. What is this world if we don’t weigh in and support worthy causes – as well as help the blind man cross the road, dish up food for the hungry etc? 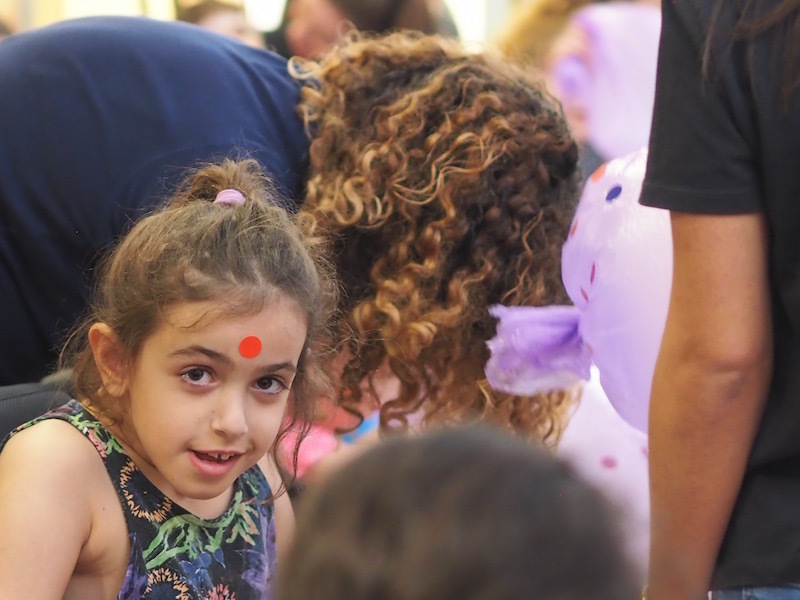 This blog post is about them; those children she and I met at Beit Issie Shapiro, while recently travelling around Israel. Adorable, endearing, courageous children who are fighting every day to take that one little step forward. To walk, to talk, to eat, to perhaps even express their thoughts; all those actions we take for granted are indeed a fight for them. We toured the campus and marvelled at the excellent care and pioneering work the charity is carrying out. From the early intervention centre (from the age of 6 months) to aged 12 at the special education school, these children are given the best possible attention with the most advanced therapies possible. Sophie spent time with Linoi that morning. 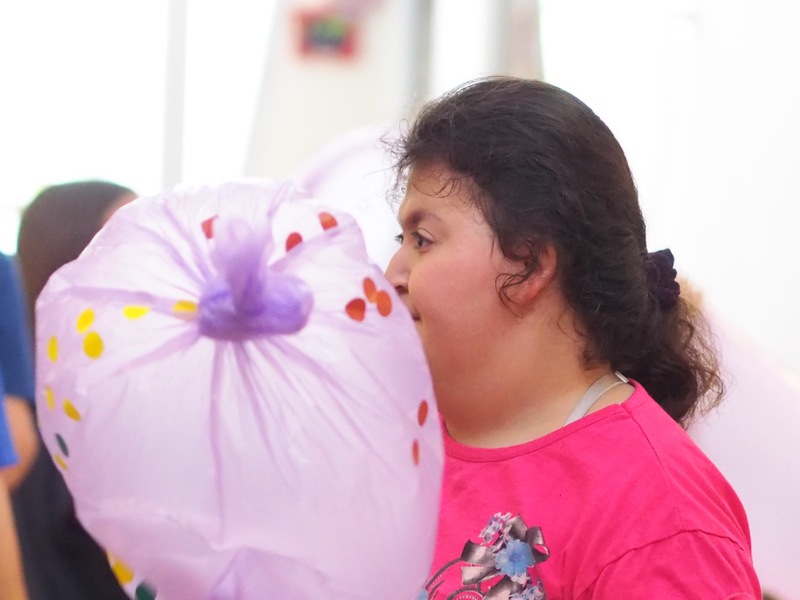 Linoi is 12 years old and first arrived at the centre aged 6 unable to walk or talk. 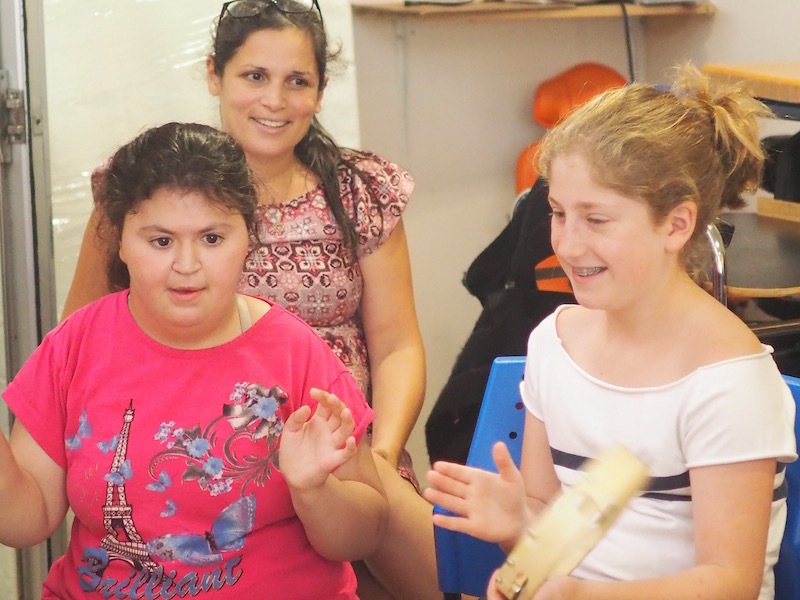 She was thrilled that Sophie was visiting and, after a few hugs and high 5s, they sat down together to enjoy a music class. It wasn’t long before Linoi was persuaded to dance and it was clear that the whole room of children with disabilities were having a ball. The professional team of caregivers and therapists (in most cases one-on-one) also appeared to be having the time of their lives, it seemed. Pure joy buzzed around the room and filled the centre. I caught Sophie’s eye and we read each other’s minds. What we had braced ourselves for: a tough morning of sorrow and pity – was utterly misjudged. The team at Beit Issie Shapiro and their dignified children were in fact showing us how they feel about changing attitudes in our respective communities and how we should view and regard anyone with any disability. 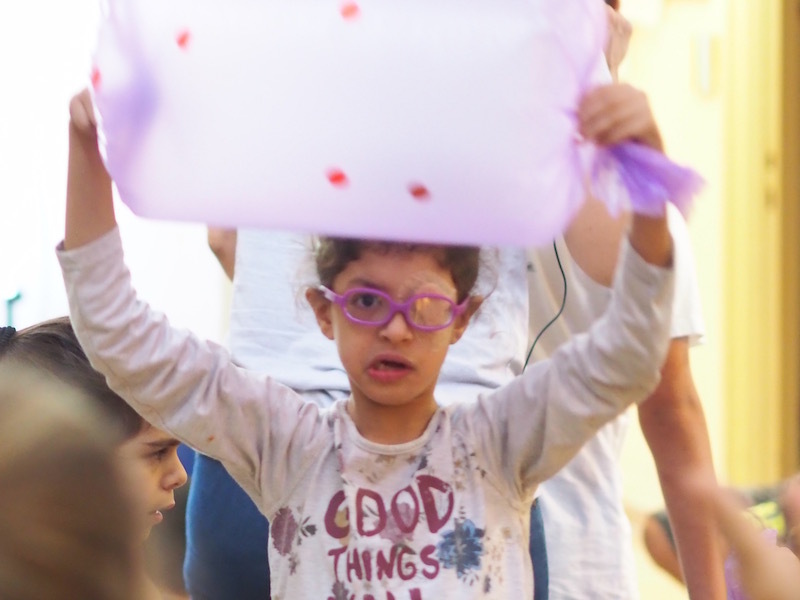 Put simply, this organisation is breaking down those barriers to full social integration – hence the reason we were sitting there with them enjoying their fun. And I’d like to think we can do more than simply observe. My girl has decided to train for a swimathon so that she can raise enough funds for the charity to purchase a new iPad and its accessories and to cover the cost of its therapeutic and recreational use by one child for one year (including work hours of therapists with the child). The detour to Beit Issie Shapiro had always been the plan. But what you can’t plan is how you will feel afterwards. How much it has an effect on you and how much it makes you STOP and think and raise your hand to help. And that’s what makes me proud of her. Please do support Sophie in her mission. We were no longer a family of 4 and I had to stop ignoring the fact that our 5th (slightly furrier) addition didn’t own a passport. Nor was he going to fully appreciate the Israeli adventure I had planned as our summer holiday. Of course I knew that kennels existed. It’s just that he was so young and I thought that it would be ideal to leave him in his own environment where he felt happy and secure. And if I’m honest (because we do adore our overseas jaunts), I often feel a little odd about leaving the house empty. There’s absolutely nothing to steal but you’d never know that from the outside. So, combine both my these 3rd world ‘problems’ and enter a friend who knew of a site I didn’t. TrustedHousesitters.com does exactly what it says on the tin. AND A LOT MORE. You see, a pet owner (who loves to travel) needs a pet lover (who also likes to travel) to come and stay over. It sounds so simple when you say it aloud. Did I mention that the sitter, that person who has promised to love and care for your animal, stays for free in your home? You don’t pay them for their pet love and they don’t pay for your dreamy home/pet. DREAM TEAM. As it turns out, the pet loving community is enormous. In fact, there are half a million trusted house sitters and owners in 150 countries looking for a pet like yours or mine. My first thought was… this can’t be right. I can’t honestly just open up my home to a complete stranger who says they like dogs. But once combing through the site, I started to feel The Trust. Members build their profiles through references, recommendations and police background checks and then when I started to emailing and skyping Angela – we were all sold. And so now we’ve been away for more than 2 weeks and I’ve what’s app’d Angela more than my mum. 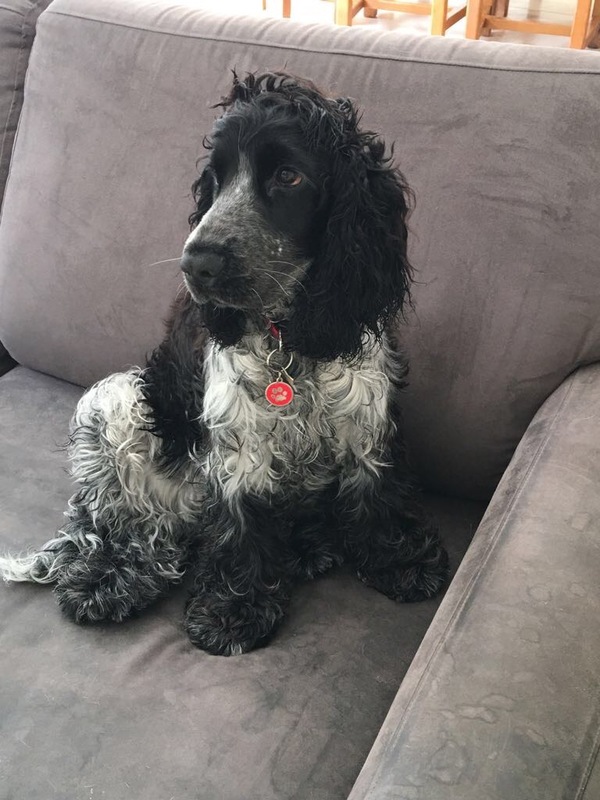 She has kept us all entertained and updated with our little cocker spaniel and his various antics. He seems so SO happy. And while we’ve missed him, we’ve been incredibly relaxed knowing what a 5 star experience he is having at home, where his heart is. What is the best thing about living in someone else’s house? 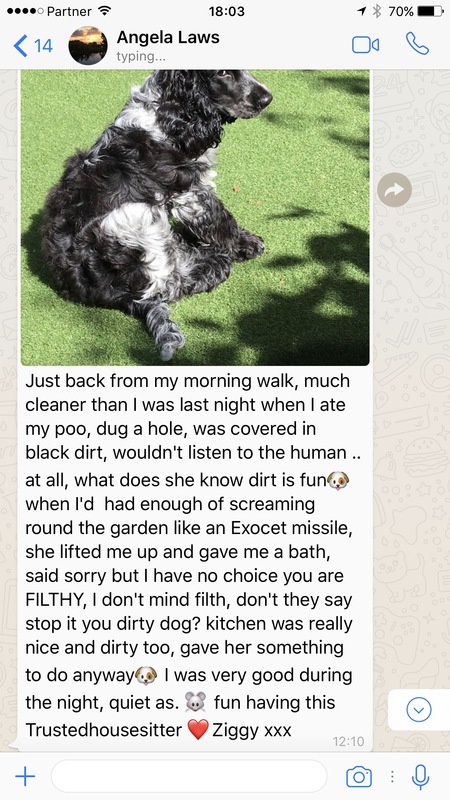 Seeing how happy the pets are and giving pet owners completely peace of mind is the joy. This is the real reason I pet and housesit. Also exploring the area and living like a local … while creating a connection with the pet’s family without being intrusive or too personal, it’s just like being home from home. do you prefer dog or cat (or any other animal) sitting? Each one is different and unique, I love them all. Cats are less demanding of your time, but dogs get you up and out .. although I would have to decline scaly creatures. Is there an ideal animal to sit? which location have you always wanted to house sit in and never had the opportunity? how would you describe Ziggy’s company? Like having a curious, mischievous and very lovable two year old, who gives you that feeling of euphoria when bedtime comes round. What will you miss about dog sitting him? Wantage in Oxfordshire – a large country property with a German Shepherd, a lab and a cat. how/do you stay in touch with your house/pet owners? While on the sit, in anyway they wish: email, what’s app, Skype. Once completed mostly email, some you stay connected with more than others, I’ve made some lifelong friends through TrustedHousesitters. tell us a pet sitting story, pls. I smiled sweetly and said “Thank you, young man”. and now tell us a secret about Ziggy/Ziggy-sitting?! Membership of TrustedHousesitters costs £89 per annum (less than the cost of several nights in kennels) and comes with free 24-hour online and telephone support. Every month the site helps thousands of pet owners choose like-minded, experienced and trustworthy sitters who will pet sit for FREE while they are away. That moment when you first wake up; that feeling that you can’t quite remember where you are. I had exactly THAT this morning. And then I remembered, it’s Part Two of our Israel adventure and the futon-like bed in which he and I were lying was on a kibbutz. A really religious one. So, I knew that we needed a day trip, it’s just that I hadn’t exactly planned what that might be when I booked the kibbutz part of our trip. Being in this environment (where we pretty much stick out like a sore thumb) had actually been a real plan though. I’m the least likely person to seek out extra curricular religious observance except that I have this insatiable desire to appreciate different cultures and ways of life. MIX THIS with a constant irritation that we live too much of the good life, I woke up right here. 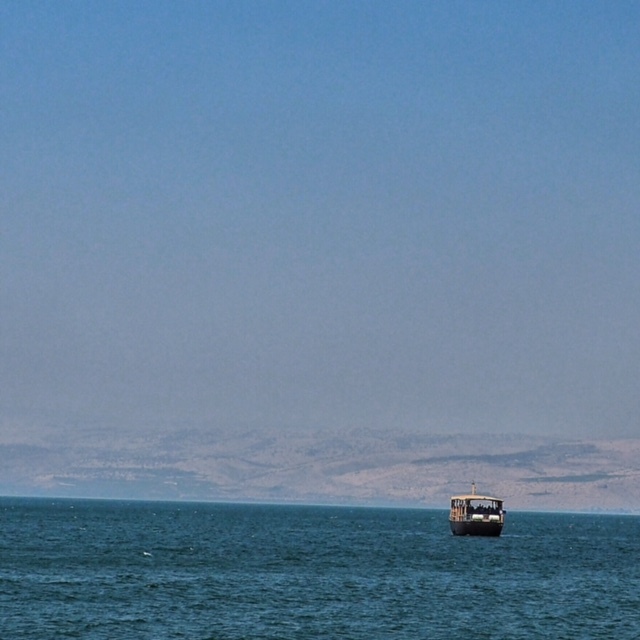 Anyway we hiked (up + down Mount Arbel) in intense heat, chilled our boots as we swam with locals in the Sea of Galilee (actually a lake) and ate dinner by the Jordan river, a popular baptism site. are you following me on Instagram @lifeofyablon? There you’ll find many more pictures + stories. Camera in hand, I unlatched the hotel fire door and crept out onto the scorching roof. It was 5 o’clock in the afternoon but still intensely bright and a solid 30 degrees. The view. The whiteness. The intensity. Suddenly I was aware I had company. A waiter on a break. He too was just staring out at the city view. ‘This is my city.’ He informed me. ‘Where do you live in the city?’ I grew curious. 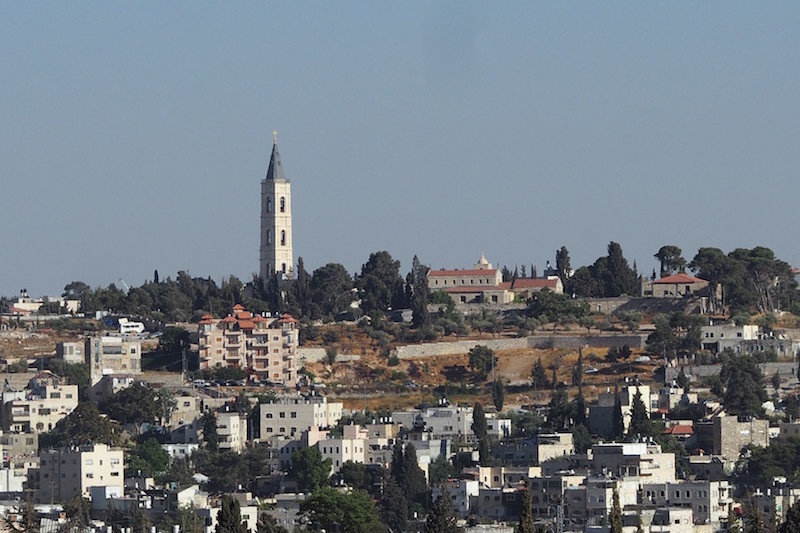 ‘On Mount of Olives, just over there.’ He pointed. I told him that we had been hoping to go there this evening to watch the sunset over the city. But that we had been advised that it might not be best. ‘Things can get tricky up there’ a taxi driver had warned us.